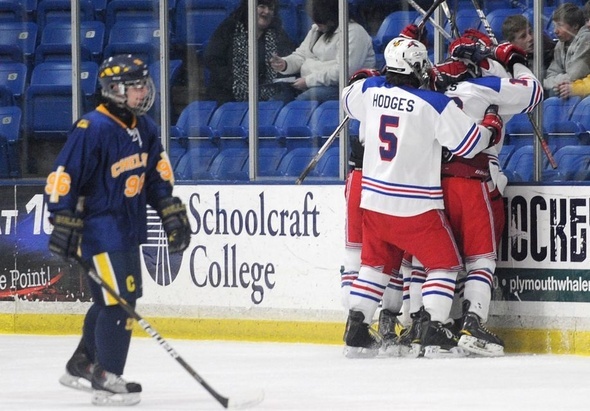 Posted on Fri, Mar 9, 2012 : 3:11 p.m.
Grosse Pointe Woods University Liggett team members celebrate after a goal during the first period of a 5-1 win over Chelsea in the Division 3 state semifinals. PLYMOUTH -- Five minutes into the Chelsea High School hockey team’s Michigan High School Athletic Association Division 3 semifinal, the Bulldogs led 1-0 and were skating well. But 36 minutes worth of penalties in the 40 minutes that remained proved the Bulldogs' downfall as Grosse Pointe Woods University Liggett scored four power play goals to defeat Chelsea, 5-1, Friday afternoon at Compuware Sports Arena in Plymouth. “Obviously, I thought the difference in the game was us in the penalty box. The story of the game was we were in the penalty box just way too much,“ said Chelsea coach Don Wright. Chelsea took the lead at the 4:32 mark of the opening period when Kyle Whipple picked up a rebound in front of a wide open net and buried his shot making it 1-0. After taking the early lead, the Bulldogs began taking bad penalties. Austin Sullens was called for roughing at 8:55 for barreling into Liggett goalie Joseph Davenport after the whistle blew. Ten seconds later Vincent Scarfone scored for the Knights, tying the game at 1-1. Three minutes later the, Bulldogs found themselves on the penalty kill again. While Chelsea would kill the penalty, Jacob Jerome would light the lamp as the penalty expired giving the Knights a 2-1 lead. With the momentum swinging to Liggett, the Bulldogs needed to regroup at intermission. But Whipple put his team at a disadvantage to open the second period after being called for roughing with no time on the clock. “Penalties are the thing we didn’t want to do and it’s the thing we did the most of, of any game we’ve played,” Wright said. The woes continued in the second period as Chelsea took three penalties and surrendered a penalty shot in the first five minutes. Chelsea goalie Chris Boyd would make the save on the penalty shot and had 17 saves in the frame. Liggett would score 38 seconds into a 5-on-3 advantage when Mark Auk found James Counsman all alone on the right wing with a pass from the point. Boyd slid across taking away the lower half of the net, but Counsman lifted the puck making it 3-1. Auk would finish with three assists, all coming on the power play. Chelsea showed some life after the goal and with 5:20 left in the period, Chelsea went on its first power play of the game. Chelsea kept the puck in the Liggett zone and got some chances in front, but Davenport wouldn't budge. After spending so much time on the penalty kill, the Bulldogs couldn’t find enough energy to put pucks past net-minder, who made 16 saves on the day. The time spent defending really took a toll on the top lines of the Bulldogs according to captain Joe Hewitt. “Especially since our top forwards kill a lot of penalties, it’s hard to get quick offense right after a tough kill,” Hewitt said. The Bulldogs still had a fighting shot because of the effort Boyd put forth. He finished the game with 30 saves including a couple magnificent saves when his team was shorthanded. After the game, Liggett coach Robb McIntyre said his team rarely spends any time working on the power play. With the game out of reach late, Chelsea began to lose its composure and three players would be ejected. Sullens was thrown out for a check-from-behind and Tyler Fullerton for elbowing. At the same time that Fullerton was called, Anthony Catalina was given a 10-minute misconduct for hitting after the play. Although his team’s season came to an end, Wright viewed the game as a learning experience for everyone the team, seniors included. “We had a great year and I thought we were a really great team,” he said. “I hope they learn from this. I think that sports and hockey is a life lesson, and you got to do that right things.